The term ‘handfasting’ is both the historical term for a wedding, or ‘betrothal’ in Great Britain and Ireland, and also the word for a wedding in Neopaganism. 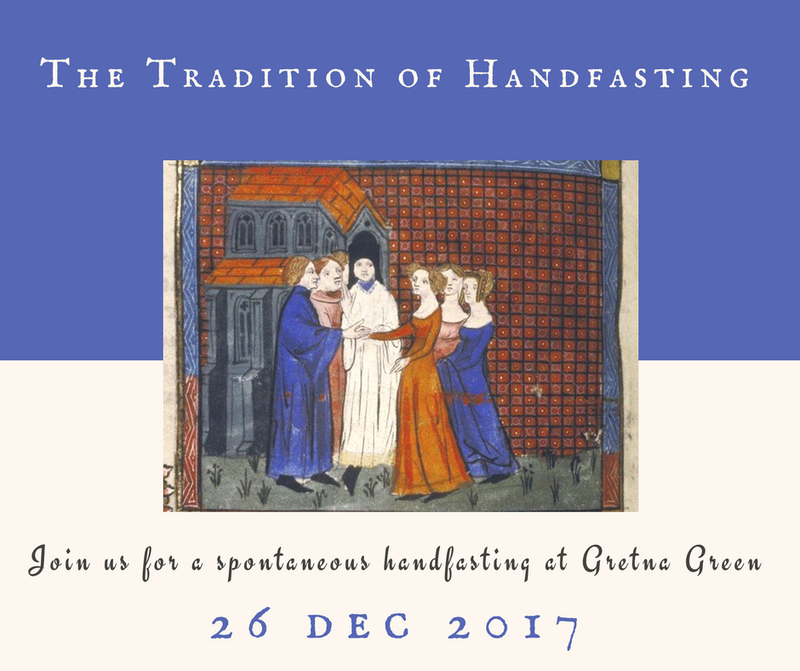 Throughout the middle ages, from the 12th to the 17th century, handfasting was commonly the term used in England to simply mean ‘engaged to be married’ and was a ceremony that was held, generally around a month prior to the official church wedding; to demonstrate the couple’s commitment and a form of contract and as a declaration of their intention to marry. It was, however, still a legally binding marriage and considered valid; though many couples and their families still did not consider this the case until after the church ceremony. But, as with any church weddings, handfasting could only be distinguished by death. 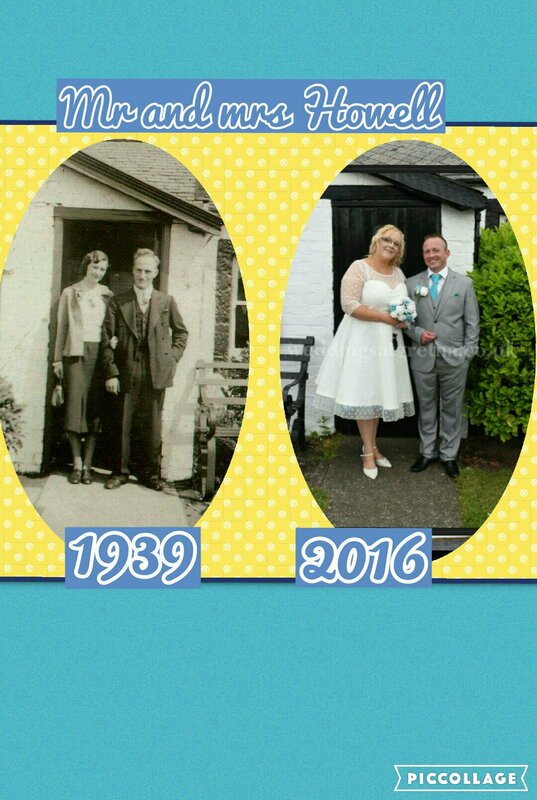 77 years ago Dennis and Eileen Howell 'ran away' to get married here in Gretna Green. Dennis knew that there was a war on the horizon and that he would enlist. Both their parents were aware that they were in love but they did not approve of marriage since they were so young. Back in those days one person needed to stay in Gretna Green for the 21 day residency act and Eileen did this without suspicion from her parents by saying that she was visiting a friend on the coast... She had even left pre-written postcards with Dennis whom then played his part by cycling to the coast to post the postcards for 3 weekends in a row... Dennis then followed his wife-to-be once the 21 days had passed and they were married here on 17th June 1939. Last week, Dennis and Eileen's grandson Simon and his fiancée Beccy did the same on the exact same date, along with their children (although they didn't have to stay for 21 days!). They even recreated the iconic photo from all those years ago! In its heyday, the Blacksmiths Shop was at the centre of village life. The village blacksmith was always at work making horseshoes, fixing carriages and farm equipment ... and was one of the most respected figures within the village. 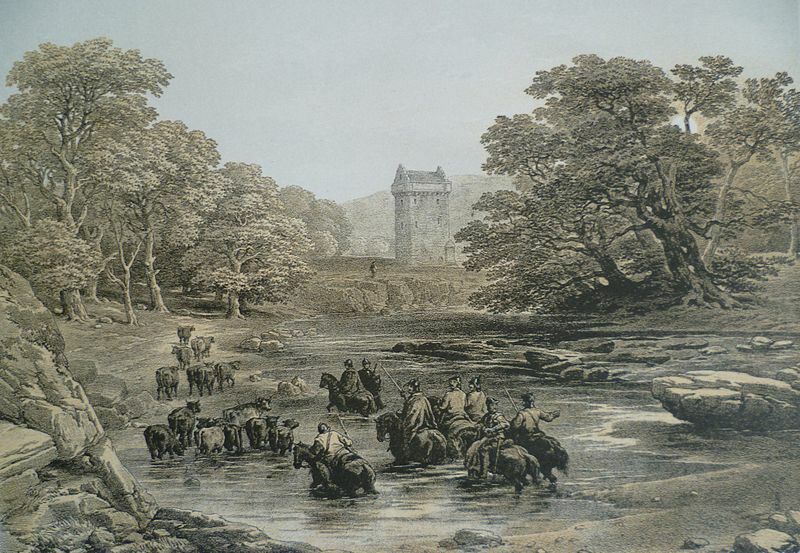 Following changes in 1754 which increased the restrictions facing young couples who wished to marry, the differences in law led to a flow of young lovers desperate to marry running away over the border...stopping in the first village they came to (most famously our wee village of Gretna Green). As a highly respected member of the community, the Blacksmith was frequently sought by these couples....and soon the 'anvil priest' arose. 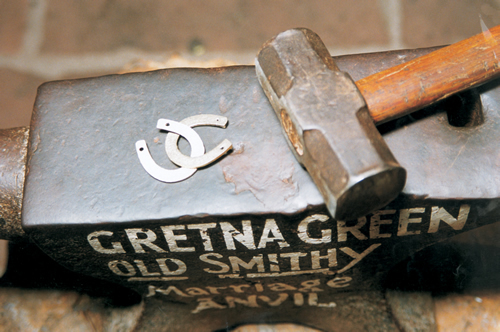 The Anvil in Gretna Green – Ever wondered why? Each year thousands of couples make the journey here to Gretna Green to get 'married over the anvil' and it's a tradition which is entrenched in history as far back as 1754 when English lords voted to change the marriage act. For couples in England this meant they had to be over 21 and gain their parents' permission to be married. Scotland however did not adopt this law and continued on its way with irregular marriages which in essence meant you could marry anywhere as a declaration in front of only 2 witnesses. Still this does not really answer about the anvil question though, or does it...? Ask almost anyone about Gretna Green and most people will answer with a remark about runaway weddings...but what do we actually know about the place? Since we've entered the month of mystery and intrigue (Halloween will be here before any of us realise! ), we thought it would be interesting to compile a list of Gretna Green stories ... and reveal the truth behind them! Over the years, we have been lucky to meet so many different people in the Famous Blacksmiths Shop from so many varied walks of life, and it's certainly true that it's a place that holds special memories for many of our visitors. 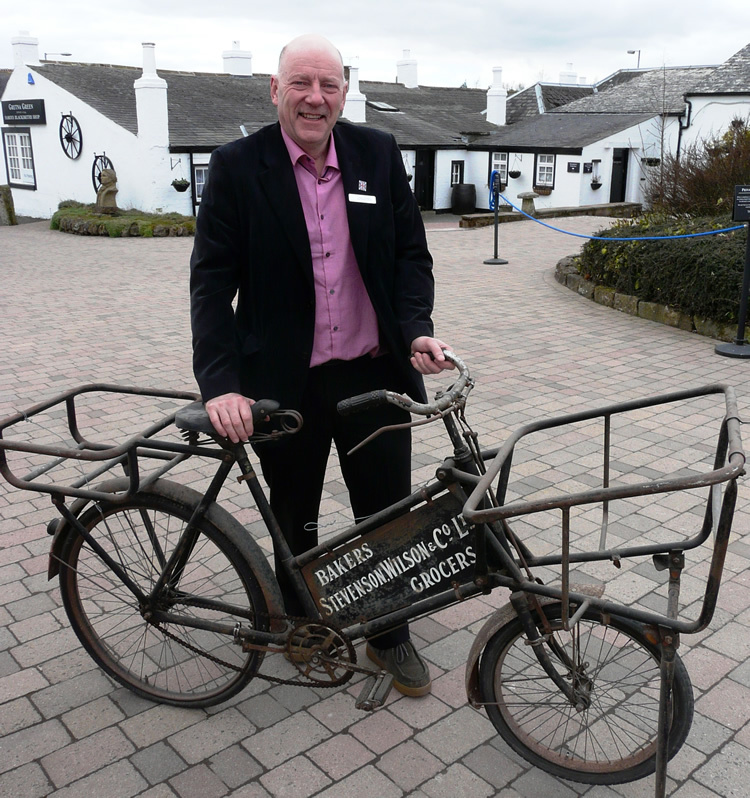 Last weekend, we were visited by 3 generations of a family, with a very special connection to Gretna Green's Famous Blacksmiths Shop. Just like Jane Austen's Pride and Prejudice, Gretna Green has its own 'enduring love affair' story... in fact it dates back to even before this great novel was written. Harking back to 1754 and with the introduction of a new controversial Marriage Act in England, Gretna Green flourished as a haven for runaway couples and has been growing in popularity ever since... With mentions of this little village in not just 1 but amazingly 3(!) of Jane Austen novels, Pride & Prejudice, Sense & Sensibility and Mansfield Park, we can safely say that Austen herself had a genuine, sincere affection for Gretna Green.